Actin filaments are the essential components of the cytoskeleton that provide the elasticity of a cell. In a cell they interact with many proteins and in particular molecular motors. 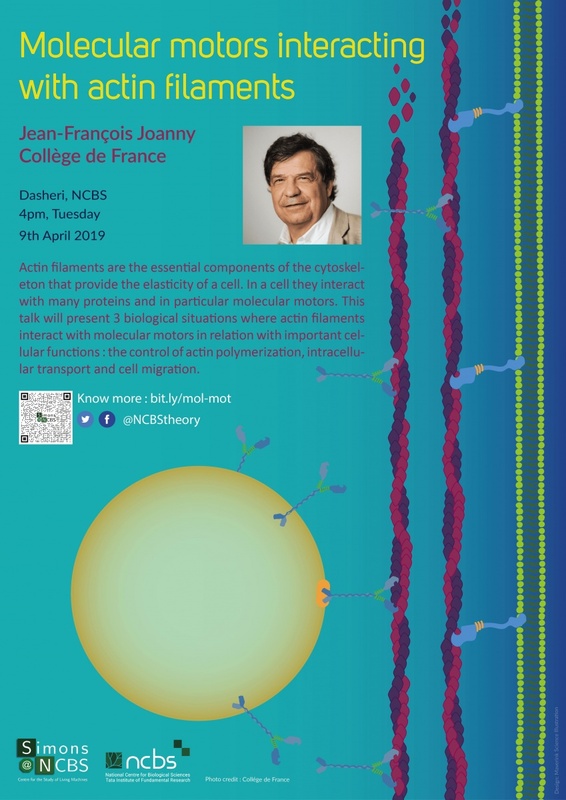 This talk will present 3 biological situations where actin filaments interact with molecular motors in relation with important cellular functions : the control of actin polymerization, intracellular transport and cell migration. Actin filaments are treadmilling: they grow at one end and depolymerize at the other end. The first example of interaction between actin and molecular motors deals with the induced depolymerization of actin filaments by myosin1b molecular motors studied in motility assays. The depolymerization requires a catch bond motor with a detachment rate decreasing strongly when the motor is under force. Molecular motors navigate the cytoskeleton to position vesicles and organelles at specific locations in the cell. In order to understand this transport process, the group of Pascal Martin at Institut Curie has used an antiparallel network of overlapping filaments. Beads coated with myosin motors accumulate at the midline of the pattern. The accumulation is well described by a three-state model of bead transport, in which active beads locally sense the net polarity of the filament network by frequently detaching from and reattaching to the filaments. The migration of immune cells is guided by several chemical signals, but also by physical cues such as the hydraulic resistance of the vessels in which they travel. This barotaxis effect has been studied in vitro by the groups of M. Piel and A.M. Lenon using microfluidic channels. We show that barotaxis results from a force imbalance at the scale of the cell, amplified at the scale of a network of vessels.